SuperOrca from “Pantaray Research Ltd.” is a direct replacement to the “Orca” MSI Editor from Microsoft. SuperOrca may be used to examine and modify an MSI database in order to distribute a new MSI package. If you’re looking for traditional Orca MSI Editor, click here. Can be freely downloaded from the internet, no need to download and install the complete Microsoft SDK. 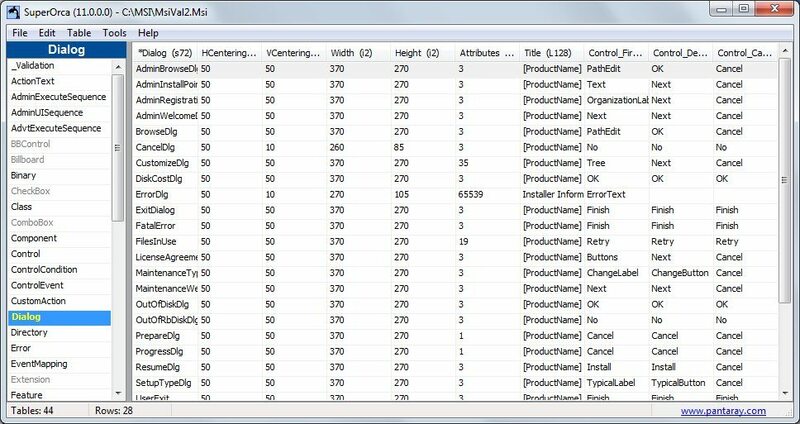 Will allow you to scan and manipulate all MSI database table in an intuitive and user friendly manner. SuperOrca will not lock the MSI file, so you can test it with other tools or even install it while the file is open in SuperOrca. A powerful “Compare” function that will compare two MSI files. A “Search all” function that will search a text literal across all database tables in one operation. Super Orca delivers an MSI Database Editor and let you discover the depth of MSI Database. This download also includes a user manual.